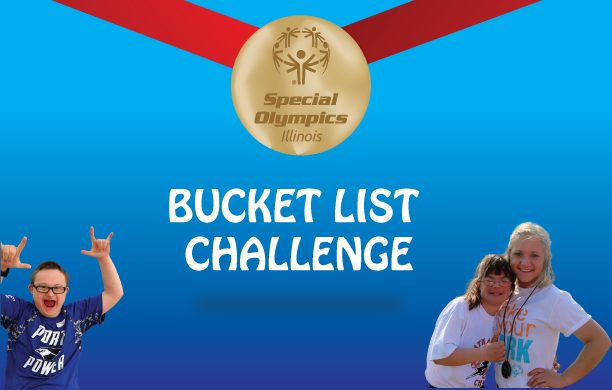 We’ve compiled a list of feel good, do good activities to help you get involved with Special Olympics Illinois in 2017. We hope that with every item checked, your love for our athletes grows and the joy you feel is shared with the world around you. It’s as easy as 1..2..3! 1. Take a photo or video accomplishing an item on the bucket list. 3. Check it off your list for a chance to win prizes all year long! Download Your Bucket List Here! NO PURCHASE/DONATION IS NECESSARY TO ENTER OR WIN. A PURCHASE OR DONATION DOES NOT INCREASE THE CHANCES OF WINNING. Campaign Period: Entries will be accepted online starting on January 1, 2017, 12:00PM Central Time and ending December 30th, 2017, 12:00PM Central Time. Special Olympics Illinois athlete Jacob Cross of Bloomington is looking forward to repeating the Polar Plunge at Bloomington’s Miller Park on Feb. 25, 2017. Jacob has come up with a rather unique way of raising the minimum $100 to participate in the event that helps both Special Olympics and the environment. Jacob was all in. He already had experience collecting aluminum cans; he had collected cans as a cool-down in the local parks after track practices. He started with purpose over the summer and ramped up his efforts this fall. 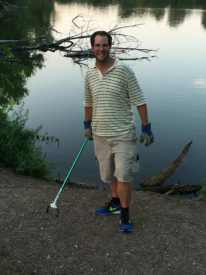 He visits local public parks to collect the cans and takes them to a local recycling plant to exchange for cash. “Right now, aluminum cans are getting 30 to 35 cents per pound,” said Julie Cross. As Jacob’s friends and family have heard of his fundraising efforts, they have been collecting cans and recyclables for him. “We even had someone give us tires so we can recycle the rims,” said Julie. “Now we just have to figure out how to get the tires off the rims,” she said with a chuckle. Jacob, 26, has been a Special Olympics athlete since he was about 10 years old. He has concentrated on swimming through the years, deviating to athletics (track & field) for two years. He started swimming with Special Opportunities Available in Recreation (SOAR) as a boy, swam with Bloomington Parks & Recreations summer team and then swam on the boys’ swim team at Bloomington High School. He now swims with the Tri-Valley team because their practice times fit best into the family’s schedule, his mother said. As of mid-November, Jacob had collected $175 for the Polar Plunge. Jacob has the second tier of Plunge fundraising in his sights – if he raises $275, he’ll qualify for the exclusive Polar Plunge water bottle in addition to the Plunge sweatshirt he’ll get for raising the $100 minimum. If he gets to $500, he’ll also qualify for the Polar Plunge backpack in addition to the water bottle and sweatshirt. Register for the 2017 Polar Plunge at any of the 22 locations and give athletes like Jacob the opportunity to transform their lives through Special Olympics. Hundreds of athletes across the state are experiencing the joy of competition as they embark on a new journey with an emerging sport. 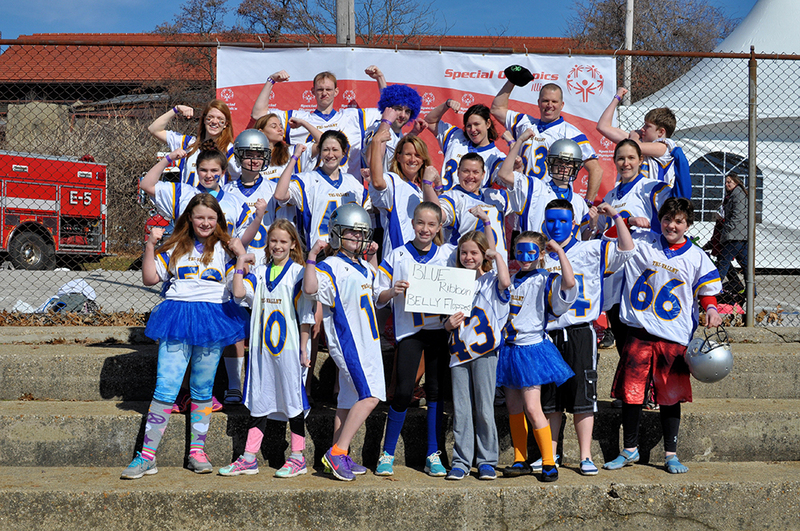 Special Olympics flag football has become widespread throughout the state of Illinois. 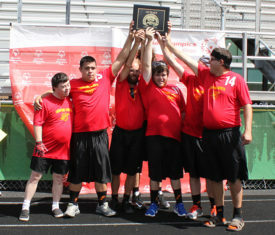 In 2015, Special Olympics hosted two Flag Football Tournaments, including the first-ever Special Olympics Illinois Flag Football Tournament held in northern Illinois at Stevenson High School, Lincolnshire. The Southern Illinois Lightning Bugs celebrate their win at the 2016 Northern Illinois Flag Football Tournament. This year, Special Olympics Illinois doubled that, hosting four flag football tournaments throughout the state, and in its second year, the northern Illinois tournament saw more than 150 athletes and coaches compete from 11 different teams. The southern Illinois tournament hosted in Southwestern/Area 12 grew from 8 teams to 17 teams competing. 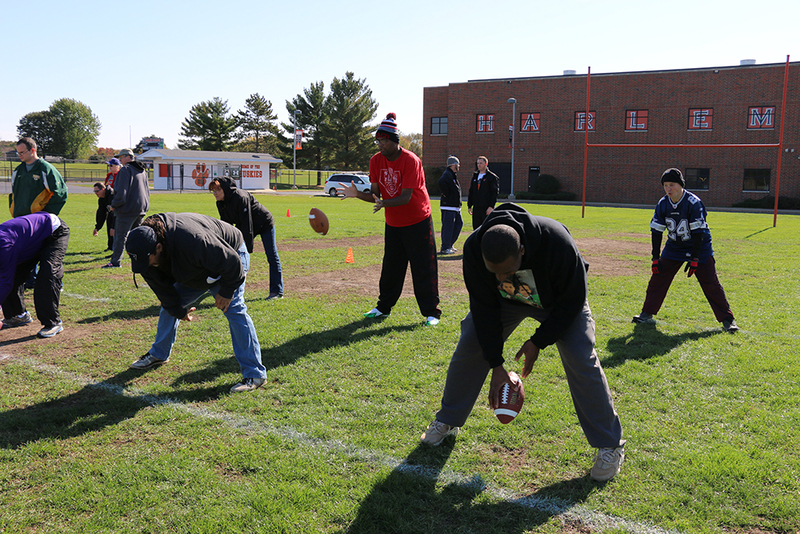 In an effort to expand flag football, Special Olympics Illinois offered a flag football Certified Training School at Fall Games this year. The training included knowledge, tools and resources for starting and organizing a flag football team, as well as hands-on practice with passing, snapping, ball skills and playmaking. More than two dozen athletes and coaches became certified in the sport. Flag football athletes compete in divisions by gender and ability levels with games consisting of 20 minute halves with a running clock. If you are interested in learning more about flag football or about becoming certified, please contact Brianna Beers. Volleyball players, coaches and family members may have noticed a new face on the court during Fall Games on Oct. 23, 2016. The fresh face on the scene was Orintho Farris, an official who is also a student at Rockford Auburn High School. Farris has been enthralled with officiating since he was young. As a young boy watching a game, he questioned who the people in the striped shirts were and what they did in the game. He soon learned they were the rule keepers. Farris, a rule lover himself, was inspired. Farris now officiates basketball, volleyball, softball, baseball and football. 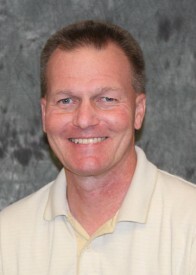 His active involvement with the Illinois High School Association (IHSA) lead him to many events. 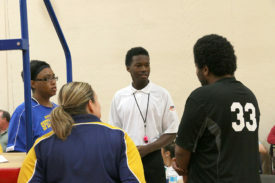 When the opportunity to officiate at Fall Games arose, he was quick to accept. 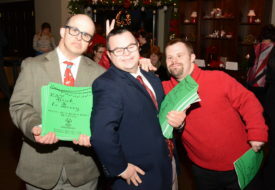 Special Olympics Illinois Far West Suburban/Area 2 invites you to begin your holiday season with the annual Special Gifts Holiday Party at 5 p.m. Saturday, Dec. 3. As the preparations begin, we ask you to consider helping out this holiday season. Your help directly and positively impacts our athletes in so many incredible ways. Special Olympics athletes have fun and develop physical fitness, they find acceptance, become confident and aspire to greatness in other aspects of their lives. As families cheer their loved ones, they experience more pride and support. When others get involved—as volunteers, coaches and donors—their actions change their lives and the lives of others in extraordinary ways. Donations will be accepted until Dec. 1. Please mail donations to: Special Olympics Illinois, 500 Waters Edge, Suite 100, Lombard, IL 60148. 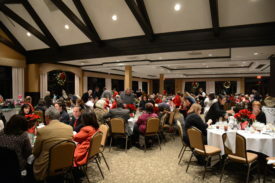 The evening includes raffles, athlete caroling and a live and silent auction at the Bartlett Hills Golf Club. Holiday Music will also be provided by the Yanni Family. Proceeds benefit more than 1,800 local athletes who compete in Special Olympics Illinois Far West Suburban/Area 2. Tickets to the Special Gifts Holiday Party are on sale now! Please contact Amanda Nelson to purchase or with any questions via 630-942-5616. 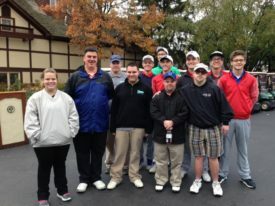 Six lucky golfers from SOILL Far West Suburban/Area 2 had the opportunity to play at an exclusive golf club thanks to the Marmion Golf Team last month. After the Marmion Golf Team placed second in their state competition, they were invited to play at Rich Harvest Farms in Sugar Grove. These athletes graciously invited Special Olympics Illinois athletes to enjoy the experience with them. This group of athletes golfed 9 holes together in the truest form of Unified sports. Caddies and forecaddies accompanied along the course. The Marmion and Far West Suburban/Area 2 relationship dates back 26 years. Marmion Academy was one of the first event host locations for Area 2. They hosted the Area track and field meet from 1974-1976, and also hosted the first aquatics meets. Special Olympics Illinois is thankful to Marmion Academy for the opportunity and to Rich Harvest Farms for hosting such a unique experience. 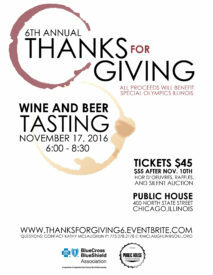 The Special Olympics Illinois Young Professionals Board (YPB) will host the 6th Annual Thanks-for-Giving (TFG6) on Nov. 17. This exciting event, Co-chaired by YPB members Alia Zander and Carly O’Toole, will be held from 6-8 p.m. at Public House, 400 N. State St., Chicago. The event is expected to sell out with more than 100 guests who will enjoy delicious tastes of beer and wine. An exciting auction and raffle is also planned with donations including Bears tickets, CUBS tickets, spa packages, theater tickets, hotel overnights, and gift cards at restaurants throughout Chicago. The YPB was created in 2006 and has raised more than $300,000 for Area 3/Chicago. A planning committee of 18 YPB members has been working on this event since March and is excited to welcome guests. 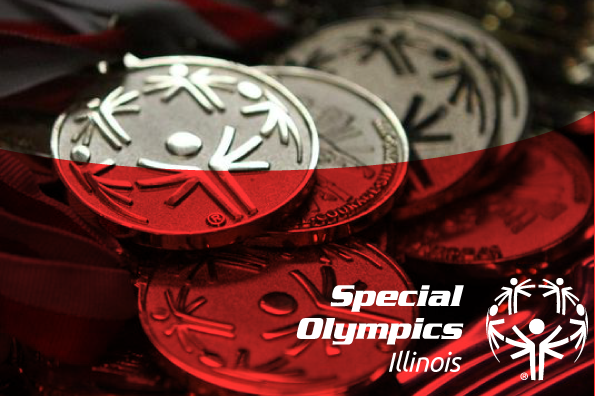 Special Olympics Illinois was the recipient of $5,000 shared by the Wells Fargo Foundation. Wells Fargo has become one of the nation’s largest financial institutions serving one in three U.S. households and serving 70 million customers in more than 130 countries. Wells Fargo has locations and team members located around the world. Suzy Thomas is part of the team at the Chicago location of Wells Fargo and has increasingly become part of the volunteer team at Special Olympics Illinois. It is because of Thomas’ tremendous volunteer participation at the Area 3/Chicago office of Special Olympics that the Wells Fargo Foundation shared the contribution. Thomas submitted an application to the Wells Fargo Good Works Committee requesting a donation to Special Olympics Illinois. The committee reviews requests and qualifying non-profits receive a contribution based on employee volunteer involvement. Thomas volunteers for Special Olympics Illinois including assistance at fundraising events and participation on the Area 3 Event Management Committee. In addition, she is a Class A volunteer and chaperones athletes to competitions and is an active Unified partner competing in bocce with her athlete partner. Thomas is a valuable volunteer, example to many and friend to all. The Area 3/Chicago program has benefited from her generous contributions for more than 14 years and has impacted on the lives of thousands! Three hundred individuals came to Northside College Prep High School in Chicago on Nov. 4 to attend the 2017 Coaches Conference. Coaches and chaperones received information related to the 2017 Spring Games competition, how to create a basketball team, policy and procedures, and other related items. The event was concluded with the distribution of raffle prizes and the presentation of the Coach of the Year Award which was given to Carmen Lopez, one of the Area’s most deserving and dedicated head coaches from Eckhart Park. Overall, the Coaches Conference was a success and the Special Olympics Chicago team is looking forward to a successful 2017! 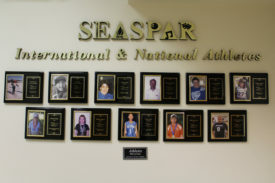 Visitors to Southeast Association of Special Parks & Recreation’s office in Downers Grove are greeted by an International & National Athletes Wall of Fame. Polar Plunge at Bloomington’s Miller Park on Feb. 25, 2017. 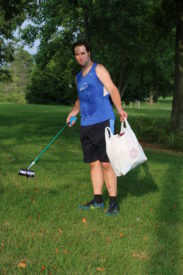 Jacob has come up with a rather unique way of raising the minimum $100 to participate in the event that helps both Special Olympics and the environment. 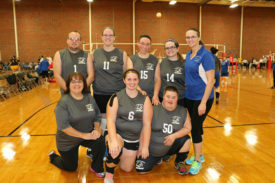 The Effingham County Lightning brought its first Unified Sports team to the Fall Games in Rockford on Oct. 22-23, competing in volleyball at the state level. The team of three Special Olympics athletes and three peers from the community is a close-knit, family-like group. Special Olympics Illinois East Central/ Area 9 celebrated after a successful turnout to The Taste of Something Special Fundraiser and auction! We were able to raise a total of $15,434! 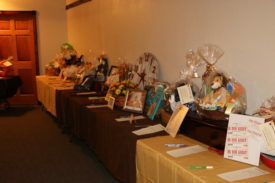 The benefit was held at The WalkWay in Mattoon on Oct. 13. Some of the items up for bid in the silent auction included a handmade wooden cooler chest, 4 tickets to Busch Stadium for a Cardinals game and a fire pit. Approximately 165 tickets to the event were sold. The Taste of Something Special raised more than $9,000 in sponsorship donations, almost $2,500 in total ticket sales and another $3,639 in raffle and auction sales! This event truly showed the athletes how important they are to Special Olympics Illinois as well as how much the communities encompassing East Central/Area 9 value their participation. Events such as these ensure Special Olympics athletes never have to pay to participate in sports competitions and trainings. It would not have been possible without the donors, planning committee, volunteers and, of course, the athletes! We would like to express our deepest gratitude for all the hard work. To further explore this magical night, follow this link to view pictures from the event. Join the Suburban Young Professionals Board for an Ugly Sweater Party to benefit the athletes of Special Olympics Illinois! On Dec. 8, don your favorite holiday cardigan from 6:30-9:30 p.m. at Conscious Cup Coffee Roasters in Crystal Lake. Tickets are $20 and include food and drinks. Guests will have the opportunity to try the brand new Special Olympics Illinois Big Dreams Coffee Blend specially crafted by Conscious Cup Coffee Roasters. Additional coffee beverages will also be available for sale. This blend features local athlete stories and bags will be available for purchase that evening. Proceeds from each bag sold will benefit Special Olympics Illinois. Felix and Fingers Dueling Pianos will provide entertainment for the evening. They offer a highly interactive and energetic show, all-request based, and designed to get people singing and dancing. As they put it: Dinner. Dancing. Dueling. Done. The evening will also include a wine pull, silent auction and raffle. This event is for people 21 and older. Tickets may be purchased online. Can’t make it? Purchase your Big Dreams Blend online here and scroll down to purchase a bag of coffee! All proceeds benefit the more than 2,000 athletes who compete in Special Olympics Illinois Areas 13 and 18. If you would like more information on the event or sponsorship opportunities, please contact Kristen Wisniewski, Manager of Business Development and Partnerships Areas 13/18, at 847-370-7370. As we near the end of the year, I want take this opportunity to thank everyone for all your efforts in 2016 and share some of the many positives that have happened within Special Olympics Illinois. We will end this year with our 18th consecutive year of growth in athletes served and saw record revenue from both the Illinois Lottery Ticket and Inspire Greatness Gala, while conducting more than 300 events. Special Olympics athletes continue to lead the way in giving speeches to record audiences and foster athlete leadership through their work on the Board of Directors. Key volunteers like the Special Olympics Illinois Board of Directors and Foundation Board are providing thought leadership and resources necessary to sustain our growth as we navigate an ever-changing world. We are very excited to pioneer new programs like Family Ambassadors, Team Wellness and the Player Development Model, while still offering 19 Olympic-style sports for more than 22,000 athletes and more than 20,000 Young Athletes with the help of 46,000 volunteers. 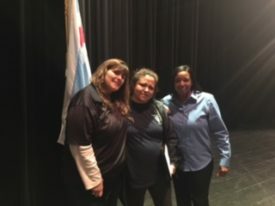 While the Department of Labor’s Fair Labor Standards Act is going to change the way we work, our team at Special Olympics Illinois was already planning a structure change to help us achieve the Big 3 Goals (Reach More Athletes, Improve Athlete Experience and Raise More Resources), laying the foundation for growth and innovation for years to come. The reorganization will focus more staff at the grassroots level to foster support of agencies. I am asking agencies and constituents to email me with ideas about what we can do to improve services. If there are barriers caused by the Department of Labor changes that are negatively impacting your agency, please let me know that as well. We are looking toward the future by developing a Strategic Plan for 2018-2020 that will incorporate your input, feedback and ideas. We are already busy planning for 2018 – a very exciting year in Illinois and worldwide with the 50th Anniversary of Special Olympics which started on July 20, 1968 at Soldier Field in Chicago. Please mark your calendars for July 20-22, 2018; we have some very exciting things planned in the city of Chicago to show the impact individuals with intellectual disabilities have had on the world as we honor the past, communicate about the present and show the vision for the future. One athlete leader projected that in the next 50 years there will be a Special Olympics athlete running their state’s Special Olympics program. With the attitude, courage and determination of the individuals we serve, I don’t doubt that in the least. Thank you for all that you do to make this a great organization serving the best customers in the world!